There are quite a few language translation apps available. Everyone has their preference. Which can be towards an app that is quick to use, helps to actually learn the language, has a huge list of words or provides complete sentences. New to this group for us is iPhraseBook. It looks good, is fast to use and has complete sentences. It doesn’t appear to an app that was designed to push you to learn a language. In fact, the long list of phrases leads one to just open the iPad and let it do the talking for you. 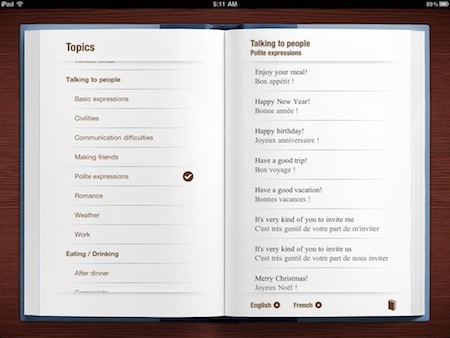 Due to the nice look of iPhraseBook, no one seems to be staring at us as they look at the iPad. So far, when we use the app to ask for a taxi, we got a taxi and not the train station. All of the 2,000 audio phrases are built into the app so you can use it where there is no Internet access. If you do have Internet access, there is also a word/phrase translation area that reaches out to Google Translate… these are saved in memory for later use so you can add a few prior to traveling if you find a phrase you need missing. From the list of phrases, just tap one to hear it spoken. Built into iPhraseBook on download is bidirectional translations for American English, French, German, Italian, and Latin American Spanish. 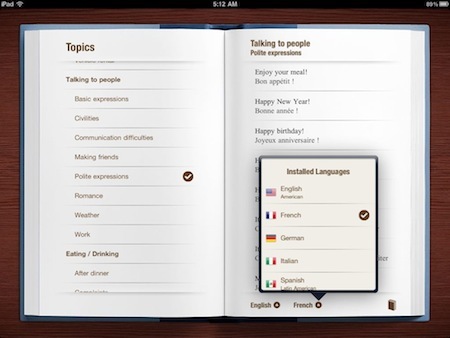 Available through in-app purchase is Japanese, Mandarin Chinese, Brazilian Portuguese, Russian, and Turkish. From the top of the page graphic, you can access the many groups of phrases so that the page your on only shows a smaller scrolling list rather than a long catch all. The list of optional groups of phrases in iPhraseBook is even faster to get through when the iPad is in landscape view. 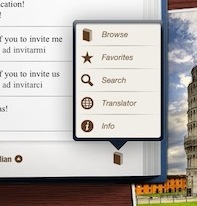 On every page, you can choose the languages to be translated to and from. This is actually pretty handy if you aren’t understanding something someone is saying. You can look at the list from their perspective and then see what it means to you. 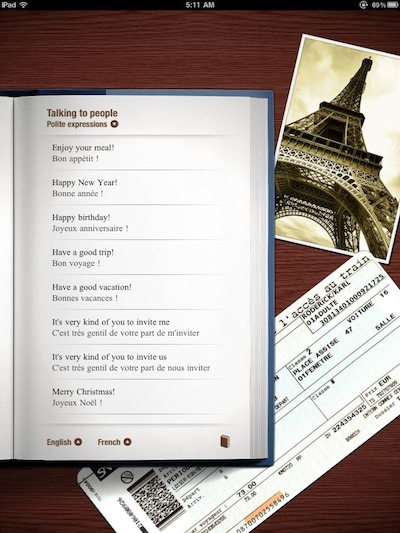 The phrases in iPhraseBook isn’t just for fun travel. There is a nice sized area of often needed Business phrases too. 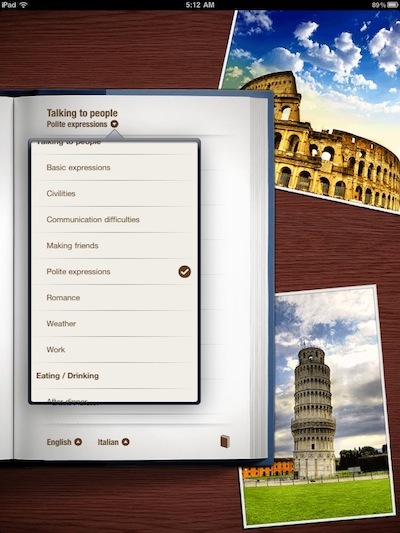 All of the above screenshots of iPhraseBook are in the ‘browse’ view. Having a list of favorites or searching through the available phrases is also supported.